You are here: Home › Footwear › Running Shoes › The new ‘biomechanically perfect’ running shoe from Airia? Whenever a new running shoe or new design feature is proposed or marketed, I tend to take notice, but not often write about it. I decided to write about this one. A Swedish company, Airia have started marketing their Airia One running shoe with the claims that it is the biomechanically ideal or perfect running shoe and that it can improve performance. If you make a claim like that, you going to get my critical attention! I was first alerted to this shoe via Pete Larsen and then a thread on Podiatry Arena (that the Airia CEO contributed to). My initial kneejerk reaction as along the lines of OMG and roll eyes! How can there be one shoe that is ideal or perfect when I had just last week wrote a post with one possible explanation as to why one size does not fit all when it comes to running? Probably the key design feature is the elevation under the lateral metatarsal heads that tapers, giving a 6mm difference between the first and fifth metatarsal heads. I never sure what to call this type of design feature: Pete Larsen called it a ‘slant’. I usually call this a ‘lateral column elevation’. Others might call it a ‘cant’, ‘forefoot valgus post’ or ‘lateral forefoot wedging’. 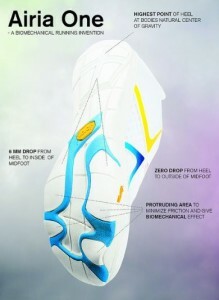 Other design features in this shoe is the zero drop between heel and forefoot and the 35 degree toe spring. I not going to focus on those design features and address my comments at the slant/cant/lateral column elevation/forefoot valgus post/lateral forefoot wedge in the context of the performance claims made by the company and the potential injury risks from this. The comments are also made based on the publicly available information and not seeing or trying the shoes. As with most other shoe brands there is a certain about of ‘marketing speak’ that goes into the promotion of the shoe. Airia claims a “as much as 7%” improvement in performance using these shoes. You can read more on what they did here in their white paper. It is preferable to see this sort of research properly published in a peer reviewed journal by independent researchers rather than something that is proprietary to the company. Without going into detail they used 10 runners doing 5km time trials in two Airia One running shoe prototypes vs five other shoes. With the exception of one shoe, they were all the same weight. The order was randomized. Its not clear from the white paper if the runners were blinded as to the condition and the purposes of the study, which could introduce bias. The results appear to show that the participants could run faster over 5km in the Airia running shoe. However, it is not as clear cut as claimed in the white paper and on the Airia website. The statistical method they used (Paried Wilcoxon signed rank test) was used to do ‘multiple comparisons’ or ‘multiple testing’. You are not supposed to do that and this is a significant flaw in the white paper, so a conclusion can not be drawn from the data until its analysed properly. Having said that, how plausible are the claims that performance can be improved with the use of the Airia shoe? Way back in 1998 one of the students I was co-supervising for an undergraduate research project looked at how high you could jump with a lateral wedge under the forefoot (like the design in the Airia shoe) and with proper randomization, blinding, repeatability etc he showed that the participants could jump almost 1cm higher wearing the wedge compared to the other conditions. So, yes, there is possibly some biological plausibility to the performance claim from Airia. It is only possible to speculate on the mechanism for this. Back in 1998 we speculated that one mechanism could be that the lateral wedging lowers the force to get the windlass mechanism established (subsequent testing shows it does) and if the windlass is easier to establish, then it is theoretically easier to get the heel off the ground, therefore this could explain why you could jump higher and in the case of the Airai shoe, potentially run faster. See my previous post on the windlass mechanism and more discussion on it below. It is possible that issues associated with the windlass mechanism are important to the design features used by Airia (including the 35 degree toe spring). However, there are so many if and buts and its probably going to be a subject specific response, I would not want to draw any hypothetical across the board conclusions. Naturally, I don’t agree because I believe in the subject specific responses to different design features in running shoes and that different running techniques load different tissues differently and there is no such thing as one size fits all because of natural biological variability. Airia have the one shoe, the Airia One, whereas other running shoe companies have a range of shoes to try and accommodate that biological variability and individual preferences. 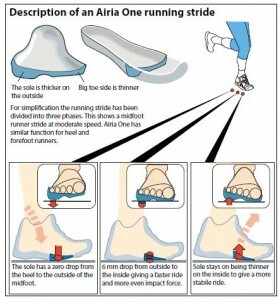 Just what are the biomechanical affects of that lateral wedging in the Airia One running shoe? As alluded to above and discussed in this post, if you elevate the lateral forefoot, you lower the forces to get the windlass mechanism established. Try this: Get someone standing and then grab their big toe and dorsiflex it. Take note of how hard or easy it is to do. If it is hard to dorsiflex, then imagine how harder it is going to be to run to elevate the heel off the ground. Imagine how high that the loads going through the tissues are going to be to overcome that higher force (~a hypothetical decrease in economy and an increase in injury risk). Now find something (a 5-6cm thick notepad, or even your hand) and put it under the lateral (2-5) metatarsal heads and then grab the big toe again and see how much force is needed to dorsiflex compared to before – most of the time it is significantly easier to dorsiflex. Now, imagine how much easier it would be to run in that circumstance: hypothetically, not as much force is going to be needed to move forward during gait over that big toe on the ground and the loads going through the tissues will be lower (~a hypothetical increase in economy and a decrease in injury risk). Is this biomechanical perfection? Unfortunately probably not as there are individual variations in the response to this and there are other factors at play, but this model or thought experiment could account for the performace claims made by Airia. A shoe like this one could be useful to lower the forces to get the windlass mechanism established, but its probably going to have no affect on those who already have a normal or low force to get it established and we have no idea if this design feature can be detrimental to these people. It could be helpful to those with a high force. This lateral column elevation (or whatever you want to call it) is something I do routinely in those with plantar fasciitis to lower the forces in the damaged tissues (see more on that here), so we could get into some interesting speculation about the use of this shoe in those with chronic issues with the plantar fascia. A similar case could hypothetically be made for peroneal tendinopathy (more on that here), but the mechanism there would potentially be via the influence of the lateral wedging at the subtalar joint and not on the windlass mechanism ….. which brings us to the other issue with the lateral wedging and its affect on other structures in the foot and further up the kinetic chain and if it is potentially detrimental or not. The lateral wedge in these shoes has a lever arm to the subtalar joint axis, so will provide a pronatory moment at that joint and a theoretical increased risk for injury if the forces are high enough (see all the “overpronation” posts). Again, the response is likely to be subject specific and potentially one of trade-offs (eg more risk from the increased pronatory moment and less risk from the easier force to establish the windlass mechanism). Look at the variability of the subtalar joint axis in the transverse plane (4 to 47 degrees). Look where the lateral wedge in the Airia shoe would be relative to that axis. Consider the differing lever arms that the wedge would have in feet that have an axis at 47 degrees compared to an axis at 4 degrees. In those with an axis at 47 degrees, the post tib muscle is working very hard as it has such a short lever arm to that axis to move the joint. The wedge in the Airia shoe is going to make it work much harder. Is this a disaster waiting to happen (~hypothetical decrease in economy and increase in injury risk). In those with an axis at 4 degrees, the post tib muscle is not having to work so hard as it has a larger lever arm. The wedge in the Airia shoe is not going to have much of an affect on this as it has such as short lever arm. Can you see why I think the affect of the Aira running shoe is probably going to be subject specific. Look at the situation of posterior tibial tendinopathy. Those with a more medial subtalar joint axis are potentially going to be put at increased risk with the Aria shoe. BUT, if they have a high force to establish the windlass mechanism and the Airia shoe lowers this, then the posterior tibial muscle is not going to have to work as hard to supinate the foot as the windlass mechanism will be able to do more. In these runners this might hypothetically reduce the risk for posterior tibial tendinopathy. Its one of trade offs and subject specific responses. I have only touched on the biological variation of the force to establish the windlass mechanism and the effects of lever arms from variations of the subtalar joint axis. There is plenty more to go into this complicated mix. It is never going to be easy. How will this shoe go? I am intrigued by it. I would like to try it in runners with plantar fasciitis. I would like to try it in those with a high force to get the windlass mechanism established. I would not be keen on trying it in those runners with a more medial subtalar joint axis. Those with a memory will recall the WARP (windlass activation and resupination paddle) technology that Nike brought out in some shoes 10 or so years ago. It was specifically designed to facilitate the windlass mechanism. While I do not know officially why the design feature was dropped, but my understanding is it was partly due to the retailers not getting it. The earlier version of the New Balance MT110 trail shoe had a slant like this one and caused at least one person a problem with their post tib. Therein is the problem with these design features. We really do lack clear guidelines, preferably evidence based (rather than the thought experiments above) as to who should get what design feature. Even if we did have these guidelines, then who should apply them. Can the retailer do it? I can clinically determine the windlass forces and subtalar joint axis position. Can or will a retailer do that? Is there life one mars? Despite my initial negative kneejerk reaction to these shoes, I do like the concept of the Airia One as it can be another tool in my arsenal for specific clinical scenarios (as that is what I do), as for it meeting the blanket claims for performance: Hypothetically, yes, but lets watch this space. 7 Responses to The new ‘biomechanically perfect’ running shoe from Airia? I must admit Craig I am always concerned when companies introduce technology that has the potential to make a significant positional change to the foot. History has been littered with companies that have tried this, and on many occasions it led to injury. Is it because the claim is faulty?.. possibly not. The problem is WHO will make the decision as to who, and when this shoe is worn. And for the most part that decision is not made by you, me or the technical footwear retailer. It is made by the consumer based on what marketing they are exposed to. And so, for the most part, I have grave reservations about this shoe, which, according to the marketing video, is suitable for everyone. Clearly this is not the case. Hey Craig I know you are a big fan of saggital plane theories which do make alot of sense. I was wondering if you could please shed some light on something for me, again only if time permits. Is the jack’s test really all that relative as it is performed during a static position that aims to replicate an instananeous moment during midstance. Do you think that as it’s assessed in bilateral stance as oppossed to the unilateral position the foot will be on when windlass is engaged? Also do you think the progression if the COM as the body progresses iver the foot won’t also influence this? For example the 1st met plantarflex’s in response to the rising of the heel. I’m still building up my mileage after my bout with peroneal tendinitis. If this shoe were on the market now, I’d definitely give it a shot! I ordered a lateral wedge from myfootshop.com, but the slope is so extreme, I feel like it would do more harm than good. This looks a little more subtle. I’m interested in your hypothesis that decreased hallux dorsiflexion stiffness should be correlated in increased running performance. If we look to the evidence we see : http://www.jbiomech.com/article/S0021-9290(97)00081-X/abstract that suggests that the dorsiflexion of the hallux during running acts to absorb energy, surely with decreased hallux dorsiflexion stiffness the energy absorption should be greater- indeed, Stefanyshyn and Nigg showed that by reducing the sagittal plane displacement of the hallux at the 1st metatarsophalangeal joint less energy was lost. So how might a decrease in dorsiflexion stiffness, i.e. greater sagittal plane displacment of the hallux at the 1st metatarsophlalangeal joint (MTP) per unit load correlate with improved performance? The literature is a bit confused on this though, since in a later study Stefanyshyn http://www.setantacollege.com/wp-content/uploads/Journal_db/Quantifying%20Muscle%20Patterns%20and%20Spine%20Load.pdf didn’t find any real relationship with MTP joint and performance- so again, how would changing dorsiflexion stiffness help performance? I agree with Christian regarding the usefulness of Jack’s test in running patients, but disagree with his conotation that the windlass mechanism can be described as a binary variable, i.e. engaged / not engaged- this is nonsense. 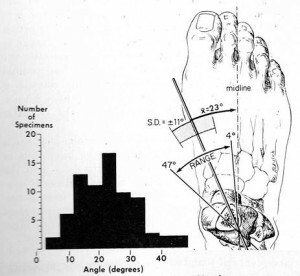 Also one must be cogniscent that the windlass mechanism in the foot occurs at all the digits not just the hallux, so if a forefoot valgus wedge lowers the dorsiflexion stiffness of the hallux, it should simultaneously increase the dorsiflexion stiffness of the lesser toes, increasingly as one moves laterally. Thus, it is the net effect which needs to considered. I can only say this, this shoe looks great, and high tech (that is my preferred, or only, variable in determining what shoes to run in – and some basic comfort of course. What I find interesting is that one of my absolute favorite uni-toed pairs of running shoes is the initial model of NB 110. I liked them so much I went and bought a second pair before they closed out. I didn’t even notice there was a “slant” until Pete Larson mentioned it in Runblogger. Maybe the soft surfaces I run on negate some of the angle, Pete may have noticed it more because I think a lot of his running is on pavement. I do know I prefer these shoes over the earlier NB 101, and the minimus zero and 10. I doubt I’ll be lining up to buy a pair of Airia’s, I am not comfortable trying out shoes that put your foot at a significant angle in any direction. The difference between the 1st and 5th met heads is 6mm in the Airia, out of curiosity, does anyone know the difference in the NB 110? What ever it is, I don’t notice it running. I also don’t know if it helps or hurts my running. I do know that I really like the feel of the NB 110’s on the trail. What a wonderfully written article. I appreciate your objective criticisms of the technology while still being open to the new ideas. One thing we have noticed in the lab is forefoot position (in all planes) changes dramatically with grip/traction of the shoe/surface and the hardness/softness of the foam. It would make sense that the effectiveness of their wedge would depend on on the foam parameters. Also–what do you think about FHL tensioning? I was thinking while reading this article that the FHL would go on slack which would make the dorsiflexion easier. But creating slack in your bungie cord might make your free fall easier too–so slack might not be optimal. Final note–I’d love to see your students research report on the jumping. We’re testing basketball shoes this month and I havent seen anything on the effect of wedging on jump height!